On Tuesday, twenty three faith leaders were arrested on Spring St. in Downtown Los Angeles. 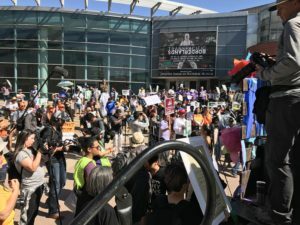 They were sitting in a line in the street stretching from the former federal court house where the Attorney General has an office, to the Hall of Justice which houses the District Attorney and the Sheriff of the County of Los Angeles. As the sun rose high over the Hall of Justice and began baking the streets, officers with the Los Angeles Police Department began the process of putting zip ties on the hands of the faithful and transporting them to Parker Center. I was among those faith leaders. We were disrupting morning traffic during rush hour because Jeff Sessions was disrupting, or rather, destroying the lives of thousands of refugee families seeking asylum in our country—families who fled violence and oppression in their own countries and ended up in a nightmare in ours. Children taken from their parents. Parents not knowing where their children were anymore. The Attorney General had come to Los Angeles to go to court to reinforce the separation and incarceration (by having the court overturn the Flores decision) and we had had enough. Twenty three clergy sat down to say, at a time when Jeff Sessions claims that it is lawful to incarcerate children, we too should be incarcerated. This is not a new question. There is a mini library of scholarship ancient and modern on this question. However, there is also a previous question to be asked, upon which there is another library of scholarship: What is the book of Jonah? The Book of Jonah was summed up nicely by the Veggie Tales folks: Jonah was a prophet, oooh oooh/ But he never really got it, sad but true. and if you watch it you can spot it, a-doodley-doo!/ he did not get the point! However, this brings in its wake the further question: Why are all the human characters vegetables, and yet the animal characters are still animals? 1. This past week’s Torah portion included the so-called “Priestly Blessing.” This short text, only four verses long, is one of the oldest parts of the Torah. It has gained liturgical significance through its synagogue use as the priestly blessing, and through its home use as the way parents bless their children. The blessing ends with the following verse: “May God raise God’s countenance to you and give you peace.” The last phrase might be literally translated as “place upon you peace.” Its a very odd locution. It points to the extraordinariness of peace. Priestly blessing from the time of the First Temple. I was invited to the Valley Bet Midrash by Rabbi Dr. Shmuly Yanklowitz, the President and Dean of the VBM, and an important and impressive social justice activist. We had this conversation.